The first step in Operation "Use Up 10 Litres of Strawberries" was Breadmaker Strawberry Jam. Next up on my list was vegan strawberry ice cream. There are several tasty vegan ice creams at the supermarket, but they tend to be expensive. Fortunately, with the help of an affordable home ice cream maker, you can whip up a simple, inexpensive vegan ice cream in no time at all using canned coconut milk. I always keep the bowl of the ice cream maker in my downstairs freezer so it will be ready if the urge to make ice cream hits. The ice cream is ready just as soon as the ice cream maker stops, however it will likely be a little soft at that point. You can freeze it for a bit to harden it. Be forewarned, though, once it's frozen overnight, it will be extra-hard and you'll have to leave it out for a bit to let it soften. 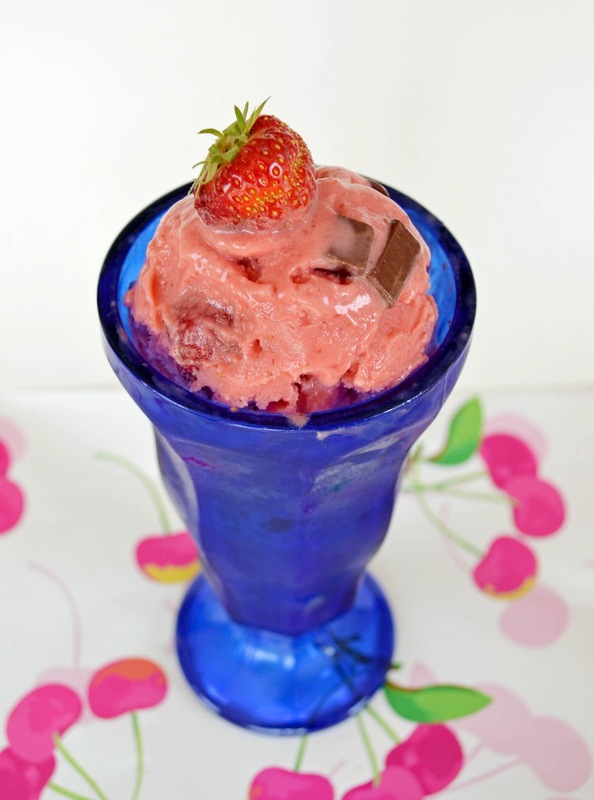 I decided to jazz up a simple vegan strawberry ice cream recipe by adding Enjoy Life chocolate chunks, a hint of almond flavouring and some extra strawberry slices. My family taste testers noted the presence of a "different" flavour at first bite, but they found it pleasant. Still, you can leave the almond extract out if you prefer. Of course, you can also use chocolate chips instead of chunks. 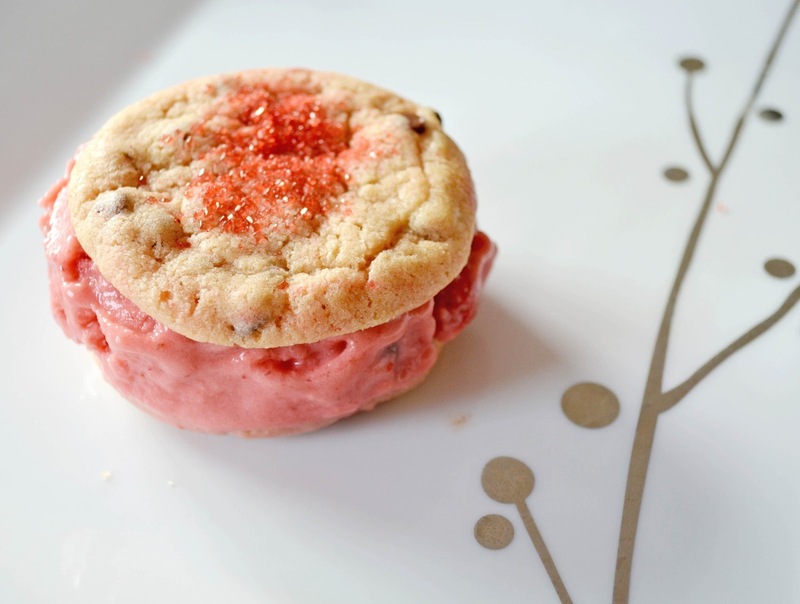 On Canada Day, I turned the Vegan Strawberry Chocolate Chunk Ice Cream into an ice cream sandwich using my favourite vegan chocolate chip cookie recipe. What's your favourite recipe to make with strawberries? Combine strawberries, coconut milk, sugar, vanilla extract and almond extract in a blender and blend until smooth. Cover and refrigerate for at least 2 hours. Process the mixture in an ice cream maker according to the manufacturer's instructions. When the mixture begins to thicken, pour the chocolate chunks and the additional strawberries through the lid opening. Transfer mixture to a container and freeze to harden slightly. This looks and sounds delicious. I'm loving how good this is for the skin, too! I never thought of that Wendy! It looks so pretty and summery not to mention yummy. It's surprisingly easy. :) I am getting used to coconut stuff now. I didn't take to it right away. ACK! I am so trying this asap!!! Looks & sounds delish!